I know onion rings aren’t for everyone and honestly they’re not even always something I like. They have to be cooked just right. I don’t like them too thick and they can’t be super juicy either. I like them more on the thin and crispy side. Those sadly are hard to find but some places do them right. 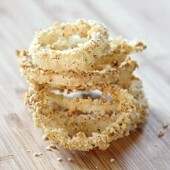 I’ve tried to duplicate fried onion rings a couple of times and was never happy with the results. 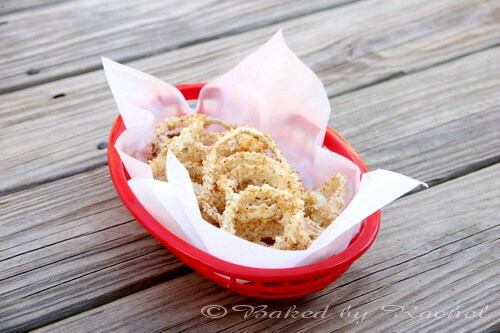 This weekend I made a split batch of onion rings for testing purposes. One half was coated in a spiced flour mixture and the other half was coated in a spiced panko mixture. The other difference, one was fried and the other baked. I had such high hopes for finding a fried version I’d like but it was another disappointment. It wasn’t right at all. The baked version was awesome though, so I had to recreate and tweak it a bit the following day so I could share with you!! You need these. 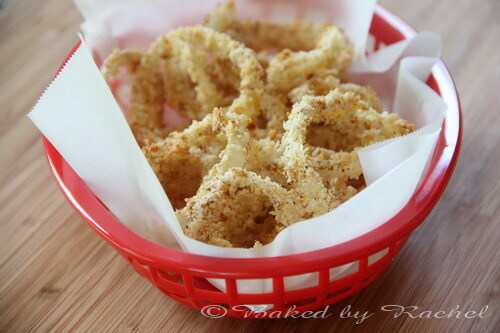 If you’ve never had baked panko onion rings, you need to make them. The thickness and juiciness can be adjusted to your liking, as well as the spices. I like mine with a bit of a kick. Without is fine too but I like the spicy after bite. They left my kids requesting bread to cool off their mouths. The funny thing is, they still totally loved them. Even better than the bite or the ability to tweak to your own liking… seriously… the crunch! Have you ever used panko breadcrumbs before? If not, you’re missing out! You need these in your life. They’re amazing. They change up a good recipe or food to an awesome one in a pinch. I’ve used these on chicken, mac and cheese and now onion rings. I’ll never go back to basic onion rings or breaded chicken again. Never! Preheat oven to 375 degrees. Prepare a baking sheet with parchment paper or a wire rack. Cut top and bottom off of your onion. Remove outer ring and skin. Cut rings to your desired thickness. Set aside. In one small bowl add breadcrumbs and spices. Stir well to distribute spices. In a second small bowl beat eggs. 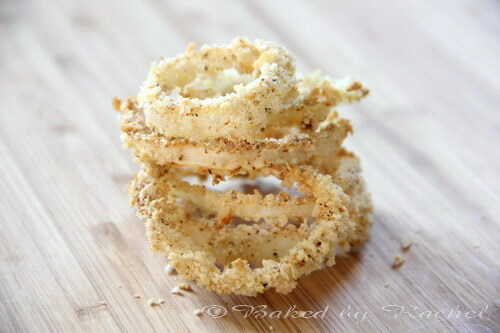 Add several onion rings to eggs. Coat well. 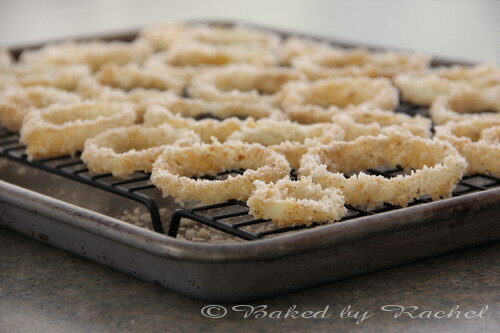 Transfer one ring to panko mixture, toss breadcrumbs onto ring. Remove and gently place on prepared baking sheet. Repeat with remaining onion pieces. Bake for 10 minutes or until desired crispness, watching carefully to not burn.